Games Meet Metal: ......and maybe, if I wish really hard, they'll actually make this tour! ......and maybe, if I wish really hard, they'll actually make this tour! 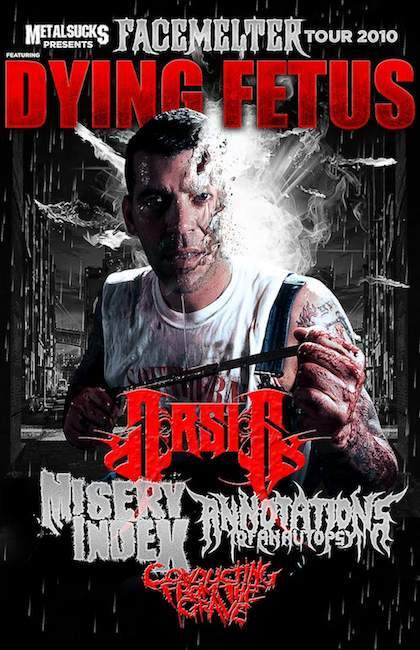 Arsis is a band that has missed more Detroit dates than I can count. Some dates have been the result of health problems with lead singer/thrasher James Malone, others just for entire tours being outright canceled. And each tme, Detroit fell under the chopping block. The one and first time I was able to catch them supporting God Forbid, I was blown away. Their big breakthrough cd, We Are The Nightmare, had yet to come out, but you could tell then that they were destined for heavy metal glory. The super techy guitars, the awesome drums, and vicious vocals were all there. The attendance? Eh, not so much. But now, Arsis have a chance to make up for their tardiness with a new tour that just happens to have an awesome line-up. Dying Fetus is headlining, with Arsis in lead support. Misery Index, Annotations of an Autopsy, and Conducting from the Grave round out the support acts. Sounds like one hell of a night for sweet tech-death metal! Now, let's just hope they all come.